Lahore has more than enough medical colleges and teaching hospitals to cater the needs of health and higher medical education of the 20 Million people of Lahore. 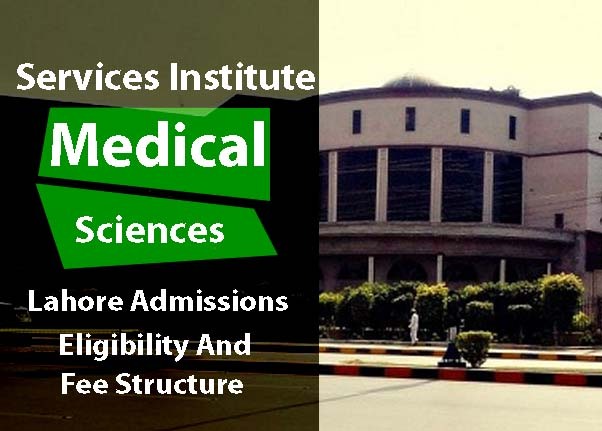 Services Institute of Medical Sciences or SIMS in its shorter form is one of the most recent medical colleges in the suburbs of Main Lahore city. As part of the public university programs, it won initially funded wholly by the government of Punjab to be operational. Still, SIMS and Services Hospital Lahore is getting a full subsidy and findings over the health and education. Initially housed in a small building, SIMS became a fully functional medical Institute in 2003 in the College of Community Medicines, Lahore. The new campus is located in Jail Road Lahore besides Punjab Institute of Cardiology and Services Hospital Lahore. Services Institute of Medical Sciences is now working as an affiliate to the Services Teaching Hospital. It has now numerous departments, libraries, theater halls, labs with ISO certified equipment, highly experienced faculty and assisting staff. The admission criteria are tougher due to a large number of applicants. The services Hospital was structured by breaking up MAYO Hospital for government employees, it made its way to the top of millions of patients and sophisticated machinery and doctors at service in coming years. In 2003, SIMS were established by the government of Punjab, the PGMI building and staff were provided initially for assistance to the budding Institute, as of now, Services Institute of Medical Sciences is building many of its blocks and has built most of them. SIMS are authorized and accredited by HEC, PMDC, AND UHS. As a joint body for conducting and preparing entrance tests for all the medical institutes of Punjab, UHS and PMDC conduct entry tests for all the colleges, MCAT held every August/September for MBBS and BDS vacancies all over the Punjab. For Services Institute of Medical Sciences, the last dates for submission of admission forms are from July to August every year. The pattern for MCAT had been similar since the beginning. The core subjects to be assessed for the future doctors are physics, biology, organic chemistry, chemistry, verbal and analytical reasoning subjects. After the entry test, results are held before October 31; students are advised to follow the university admission and aggregate results and merit lists. If a student is selected on open merit, he/she must submit all the verified documents, DMC’s, and fee required by the institutes. The entry test pattern is entirely based on Multiple Choice Questions (MCQs). Each subject has its weight, some subjects like English have less percentage, 30 marks of total 220 marks, Physics 44, Biology 88, and Chemistry has 58 marks allocated to the full marks. The entry test marks negative one mark for every wrong and five numbers for every correct answer. The seats for all the medical colleges on open merit as of 2016-2017 stats are 3500 for all the medical colleges of Punjab, the students competing for the limited seats are five lac every year. Admissions are opened every year in Services Institute of Medical Sciences once all the boards of intermediate in Punjab and Federal Territories announce their results for the academic years, the admission forms are available from the student’s affairs block, administrative block as well as online from the official website of SIMS. The joint prospectus of all the public medical colleges of Punjab is available online for students; the applicants must attach a challan from any bank and dispatch to the address of the institution. MBBS and BDS admission dates follow the regular dates of all the other medical colleges; the postgraduate students can apply for MS, FCPS, Ph.D., and MCPS programs. The dates for specialization courses are announced on the official website of Services Institute of Medical Sciences as well as all the leading newspapers of Punjab and Islamabad. Eligibility criteria for admission in Services Institute of Medical Sciences depend on upon the merit criteria and number of students applying for admissions that year. The merit remained 84% for the academic year 2016. For 2017, the merit and aggregate are likely to increase by at least 0.5% expected by PMDC. The minimum scores to submit forms and to sit in MCAT is 60 percent in Fsc. Pre-medical from BISE, however, it is the least expected criteria, no admission is guaranteed once you are eligible for the MCAT. As a government-run medical college, students of SIMS enjoy amenities of lowest fee structure for Medical Students all over Pakistan if selected through the toughest criteria. All the medical colleges of Punjab charge Rs. 20,000 per annum to the students regarding tuition fee. The hostel and mess charges are exclusive of the necessary fee. The government has decided to charge Rs. 30,000 for the hostel, that too is subsidized by the government of Punjab. Scholarships and quotas are provided to candidates according to their academic history, area of domicile, and need-based. Along with the individual fellowships, Prime Minister fee-reimbursement, HEC Need-based Scholarships, PM & CM Laptop schemes are provided to the students of Services Institute of Medical Sciences, Lahore. Technically, Services Institute of Medical Sciences is divided into three main blocks or units. The Administrative Department houses IT and Design section, repair lab, principal secretarial and admin offices. The other two blocks are academic sections, Basic Sciences, and Clinical Sciences Departments. The former has Biochemistry, Pathology, Anatomy, Pharmacology, Dental, and Physiology departments as the essential ones. The clinical dept. has sophisticated machinery related to anesthesia, dental sciences, diabetes, urology, and surgery sciences departments.